LaLD Car Week - Murica Monday: I don't need Friends, I got Gigawatts! I usually don’t do ‘Murican cars. But when I do... It better be something special! And sure: It was built in Europe (Northern Ireland). Had a French/Swedish engine. But was from the mind of American Engineer John Zachary DeLorean, who had great contribution to ‘Murica’s first Muscle Car, the Pontiac GTO. Engineered for his own American company DMC. And, this cast featured well known Hollywood’s blockbusters BTTF so it’s American allright. It just misses the hook to get the power if you’ve already traveled back to 1955. Or does it? Surprise! Ready to go. Travel back to 1985. Or 2015. 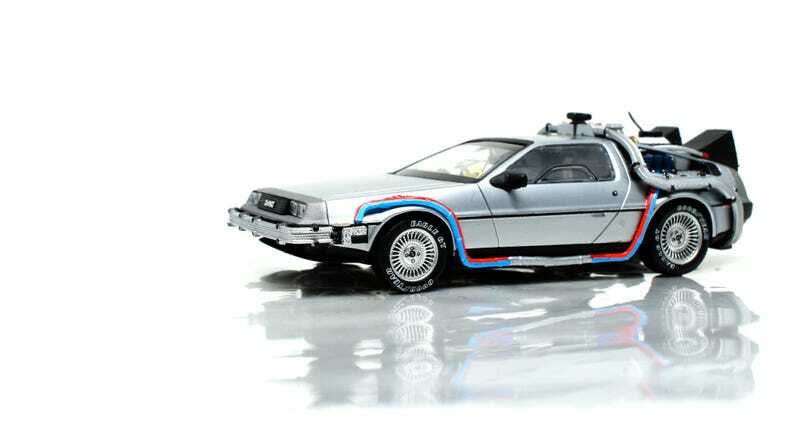 I won’t bother you with the history of the DeLorean Motor Company or the DMC-12 as it’s a well known story. So is the Back to the Future trilogy. So I’ll just bother you with some info on the model. It’s a Minichamps of course, one of 5003 produced this way and it comes in a nice gift box. The cast itself is equiped with a flux capacitor, of course. And all other stuff Dr. Emmett Brown thought was necessary to travel in time. They go on the Evil bay’s “Buy Now” for about 70 Euros, I got it in an online auction for nearly half of it so I was extremely pleased with this one. I could not set myself to recreating that scene with the burning tiremarks, I’ll leave that to Herr Tinfoil. And I’ll leave you with some pictures to look at, I hope you’ll enjoy them. So, that’s it for today. Enjoy this awesome day, I’m curious what will all come up!